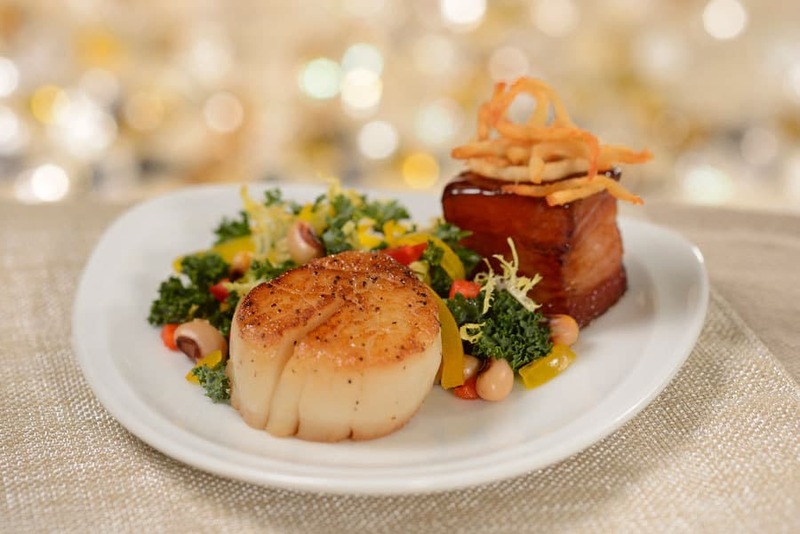 When Star Wars: Galactic Nights returns on May 27th at Disney’s Hollywood Studios, guests will be able to choose from many exclusive food options all throughout the park. Many of the dishes draw some visual inspiration from a scene or idea from the Star Wars film franchise. 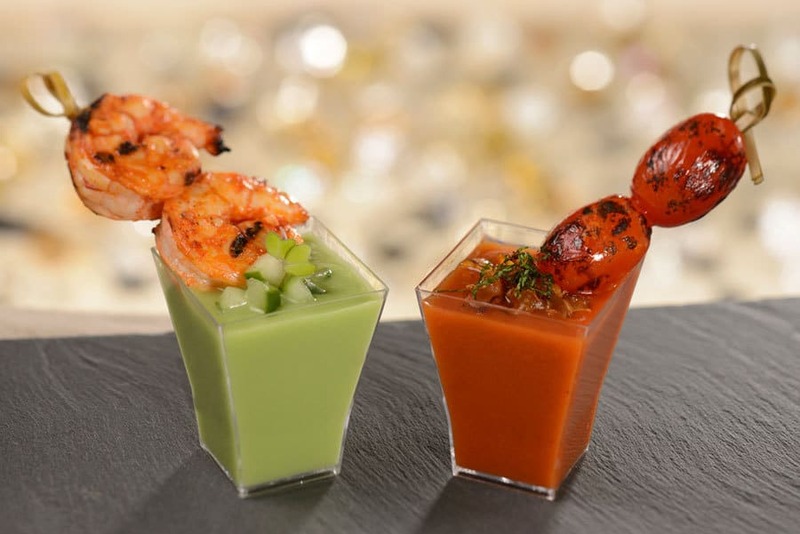 For example, this new Dueling Gazpacho dish includes both a spicy red pepper and cool cucumber-melon variants. The color contrast resembles the lightsabers held by both Qui-Gon Jinn and Darth Maul in the famous battle scene from The Phantom Menace (RIP Qui-Gon). The three-cheese pasta contains a mixed meatball of beef and lamb. Somehow this is representative of the resistance movement… I suppose meatballs are generally found on pasta dishes with red sauce, therefore this dish is “resisting” that normality? The sweet and spicy fried chicken drumstick is coated with a chili glaze and paired with a pepper jelly biscuit. The chicken leg is a call back to The Last Jedi when Chewy almost eats a Porg in front of a crowd of the adorable critters, but they end up forming a lasting friendship. The next dish is the lemon diver scallop with pork belly, a blending of both land and sea. Normally, we would call that a surf and turf, but it seems that the melding of these two items is inspired from Luke Skywalker’s time living on Ahch-To, the marine planet from The Last Jedi. 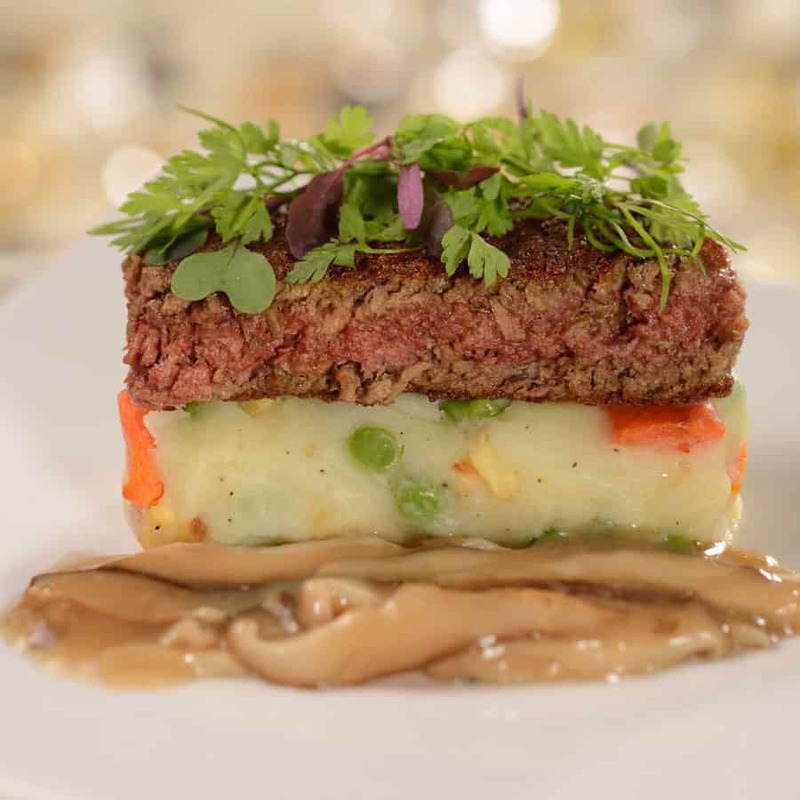 This dish can be found at the Hollywood Brown Derby Lounge. The Ewok-inspired item is the chili-soy soba dish. This vegetarian option is topped with cucumbers, carrots, and a chili-glazed deviled egg. The sweet corn cheese grits with crawfish is the Mon Cala-inspired option, just because everyone loves the classic line, “It’s a trap!” and with these delicious flavors, I could agree! The loaded red curry duck fries are topped with duck confit, red curry ketchup, and a white cheese sauce. The blend of white and red is a nod to Crait, the mineral planet in The Last Jedi. The fish and chips (literally chips, not fries) is complimented with a paprika remoulade and roots vegetable chips. This is the Rogue One-inspired dish. Why? Beats me, but it looks good. Another option for seafood lovers is the ancho-chili octopus, which will be sold at Baseline Tap House. Underneath the octopus tentacle is a bed of jicama, pear, and cucumber for a refreshing crunch. This dish is inspired by the famous scene with the Dune Sea creature on Tatooine. As far as returning items are concerned, it wouldn’t be a Star Wars event without some lightsaber churros. The Lightsaber Churro Sundae will also be returning, along with the Mini-Eclair Trio, Glow Cotton Candy, Sweet and Crunchy Popcorn, and Orange-Truffle Cupcake. Skywalker Wine Flight, featuring Sommità Chardonnay, Pinot Noir Rosé, and Sommità Pinot Noir from Skywalker Vineyards in Marin County, California. Now, if you’re looking at these items and just can’t decide on one dish, try the Galactic Tasting and Viewing Package. With this sampler package, you can taste a selection of five items – with up to 25 different specialty items and beverages (alcohol included) to choose from. In addition, you can also use this sampler for any Disney Dining Plan Snack-eligible items throughout the park. This package does not include items served at The Hollywood Brown Derby Lounge and BaseLine Tap House. You can book the Galactic Tasting and Viewing Package online or call 407 WDW-DINE (407 939-3463). All of the offerings mentioned in this post are part of the Star Wars: Galactic Nights event that will be held on May 27, 2018 from 7pm to midnight at Disney’s Hollywood Studios. For more information, or to purchase tickets, follow the link here, or call 407-W-DISNEY (407 934-7639). Discounts are available for Annual Passholders and DVC Members.